Smt. Pavithra Y. Sundareshan receiving 26th IMC-LW Jankidevi Bajaj Puraskar-2018 from Smt. Safeena Husain, Founder & Executive Director, Educate Girls. Smt. Amita Haribhakti, Chairperson Award Committee, Smt. Mohana Nair, President, Ladies’ Wing, Smt. 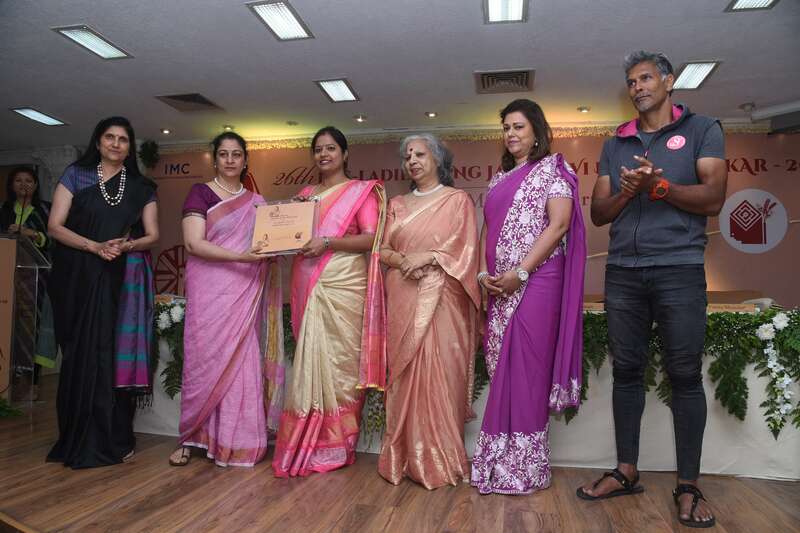 Vanita Bhandari, Vice President, Ladies’ Wing and Guest of Honour Shri Milind Soman, Super Model, Actor, Ultra Runner & Founder of PINKATHON looks on.